Instead of going fast food for lunch consider finding a grocery store instead. The ubiquitous Tesco, for example, has sandwiches for under £2. Combine that with a big family bag of chips (crisps) and a couple of bottles of water you will beat what it costs to get a hamburger. Also look for a meal deal that they sometimes offer. There are Tesco Express or Sainsburys right next to Charing Cross, St. Pauls, and HMS Belfast. It is certainly an alternative we will be exploring at least one of the days. 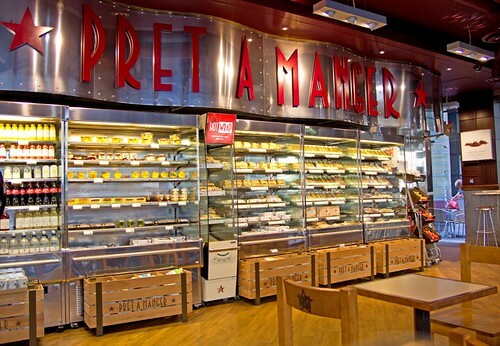 For a pound or two more is Pret a Manger. This seems to be as common as Subway is in the US, though it appears to be a little bit more upscale, yet prepackaged sandwich. Of course there is always Subway. They seem to have £3 sandwich specials just like we have $5 ones here in the States.